The doctrine that every event is predestined and must inevitably take place. According to Josephus, the question of fate—or rather, as he really means, of divine predestination—was one of the points in which the Pharisees differed both from the Sadducees and from the Essenes. The Pharisees held that not all things are divinely predestined, but that some are dependent on the will of man; the Sadducees denied any interference of God in human affairs; while the Essenes ascribed everything to divine predestination ("B. J." ii. 8, § 14; "Ant." xiii. 5, § 9). Thus the Pharisees left to man freedom of will in his spiritual life, but denied any independent initiative in his material life, which they considered entirely subject to predestination. This view is expressed in the Mishnah in the following terms by Hananiah ben Dosa: "Everything is foreseen, but freedom is given" (Abot iii. 15). The same idea is expressed in other words by R. Hanina: "All is in the hands of God, except the fear of God" (Ber. 33a). Another saying of his is: "A man does not hurt his finger in this world unless it has been decreed above" (Ḥul. 7b). Similarly it is said: "The plague may rage for seven years, and yet no man will die before the appointed hour" (Sanh. 29a; Yeb. 114b). "Forty days before the birth of a child," says the Talmud, "a Bat Ḳol [heavenly voice] proclaims: 'The daughter of A shall belong to B; the field of C to D; the house of E to F '" (Soṭah 1a). In another passage it is said that the angel who presides over pregnancy addresses God in the following terms: "Lord of the world! what shall come forth—a strong man or a weak one, a wise one or an ignoramus, a rich man or a pauper?" (Niddah 16b). 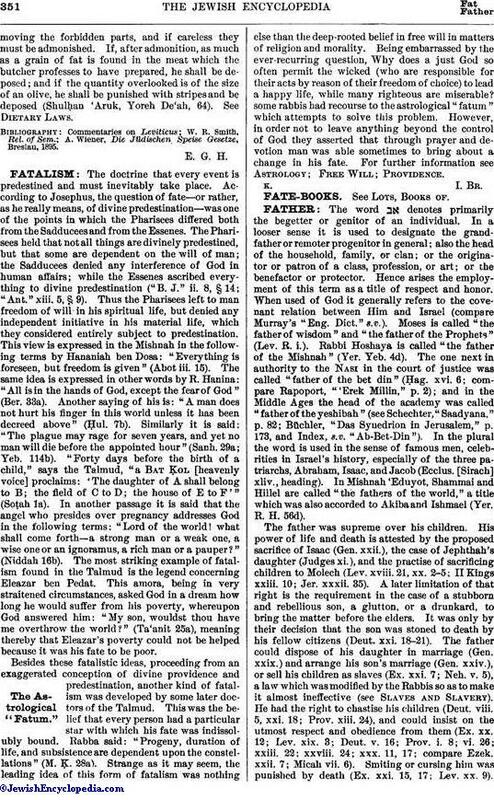 The most striking example of fatalism found in the Talmud is the legend concerning Eleazar ben Pedat. This amora, being in very straitened circumstances, asked God in a dream how long he would suffer from his poverty, whereupon God answered him: "My son, wouldst thou have me overthrow the world?" (Ta'anit 25a), meaning thereby that Eleazar's poverty could not be helped because it was his fate to be poor. Besides these fatalistic ideas, proceeding from an exaggerated conception of divine providence and predestination, another kind of fatalism was developed by some later doctors of the Talmud. This was the belief that every person had a particular star with which his fate was indissolubly bound. Rabba said: "Progeny, duration of life, and subsistence are dependent upon the constellations" (M. Ḳ. 28a). Strange as it may seem, the leading idea of this form of fatalism was nothing else than the deep-rooted belief in free will in matters of religion and morality. Being embarrassed by the ever-recurring question, Why does a just God so often permit the wicked (who are responsible for their acts by reason of their freedom of choice) to lead a happy life, while many righteous are miserable? some rabbis had recourse to the astrological "fatum" which attempts to solve this problem. However, in order not to leave anything beyond the control of God they asserted that through prayer and devotion man was able sometimes to bring about a change in his fate. For further information see Astrology; Free Will; Providence.